This is the thrilling conclusion to a storyline that started HERE! So this is the end of my week long experiment into writing a story arc for I am ARG! I had a blast making these strips and I’m glad you guys seemed to like it. I am definitely going to try so more story arcs in the future… Let me know what you guys thought of this in the comments. ALSO POLL FOR YER AMUSEMENTS! So I had mentioned on twitter that I grabbed a 3DS for the reduced price and a copy of Ocarina of Time. I haven’t had a chance to touch it really as the Girlfriend has been playing it non stop. Also it’s her birthday today! so leave her a Happy Birthday comment in the comments section. Just refer to her as “ARG’s Girlfriend” yeah that’ll go over well. HAPPY BIRTHDAY ARG’s Girlfriend! That’s a good example. In fact I’m not opposed to you guys just copying that and pasting that. The sentiment is the same right? 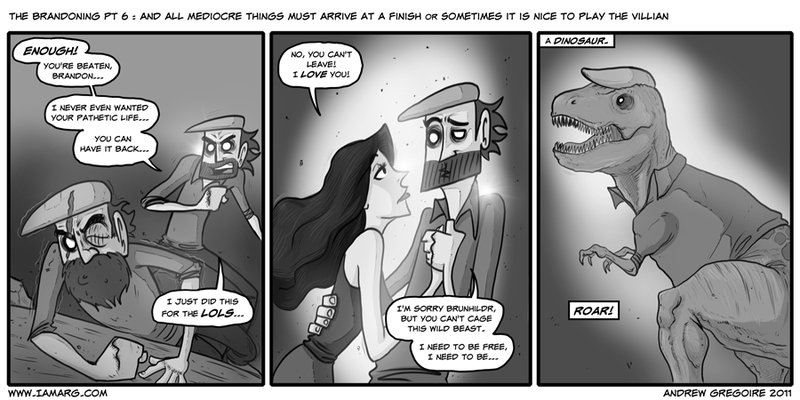 I would have been so tempted to make the dinosaur say rrrARG! Or something. Ah, self referential humor. happy birthday ARG’s girlfriend. lol and i liked the story arc. i wonder what the next one will be. Very good arc Andrew, it was awesome. I seriously hope there’s more of this in the future. Also, happy birthday ARG’s girlfriend! I plan on making more! and happy birthday to you, ARG’s Girlfriend. Have a good birthday ARG’s GF. Didn’t expect the ending, it was like the Spanish Inquisition. Also, will we see Brandon in another Comic, or he took his life and got far away from you? i will not divulge that info, I will say that Brandon is not dead. What a quick answer… went to read the arc again and I found this 3 minutes later. Anyway, now that it is clear that you are a dinosaur, will you be appearing as your human disguise or your dinosaur true form? Did NOT see that one coming, u just pulled a “Luke I am your father” moment. I’m not sure it’s THAT profound but that’s good company to be in. I’d like them if they were rare. Like, once every other month or something. I think your daily “journal” humor is a lot funnier. thanks! Yeah I plan on making it a sparse thing and never taking up a huge chunk of time on the site. one week is enough i think. thanks for being honest! hahahah…this reminded me of when we would send emails at work….awesome! Great comic! Happy Birthday Girlfriend of ARG! Yeah, the Trex needed to say ARG! Happy birthday A… wait, I mean, thanks everyone :D! OH NOES! YOU KNOW HER NAME! It’s good to see your poll got this many votes. This comic is catching on! yeah it seems to be making some good strides. I’m surprised with the voter turnout too! That has been the experience in this household as well, with most Zelda games; hubby gets the controller back so he can kill a tricky boss, then I take it over again. I think that might be what they have in mind, actually. I bet kids do the same thing with their dads (or extra-leet moms). Happy birthday missy! I’ve beat the game more times than he has, he’ll be the one asking for help! It’s true she’ll be helping me out this round…. Free to roam until extinction comes; better get that winter coat out, or some lava-proof floaties, depending on your dooms day preference. I prefer Meteor proof Underwear. They do make everything better. so open the door and get on the floor, and we’re going to walk the dinosaur? I liked the story and would like to see something like it again, but would rather the normal comic more regularly. cool! Thanks for the input! I’m planning on having another story but It will never take over the comic entirely. they may be shorter too. I definitely dug the storyline. One-offs are good, but in my opinion, you can tell someone’s really getting into what they’re doing when they discover they have a story they want to tell that they can’t fit into three panels (or whatever restrictions they impose upon themselves). Since it seemed this started off as a bit of a fling, it’s definitely pretty sweet to see you having more fun with it.